This is the Retrakt Pen by Karas Kustoms. It’s machined out of aluminum and uses the popular Pilot G-2 gel refill. 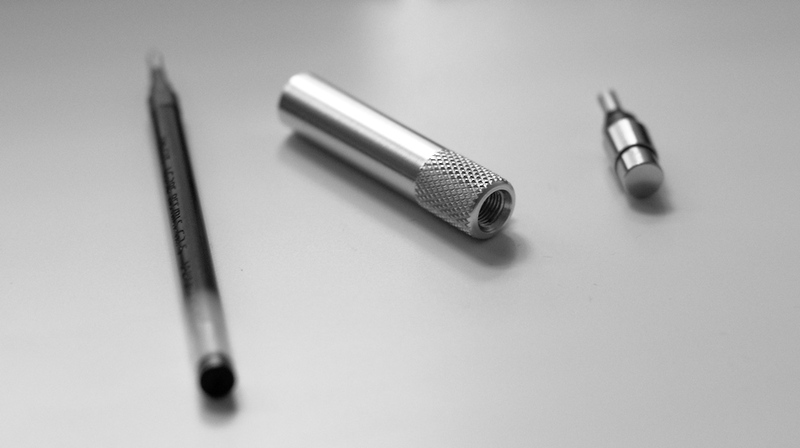 While this pen is made out of solid metal, machined in the US, and looks neat, it’s not a good pen. The clip is made of stainless steel and feels quite durable. It comes with two springs (one shown here) and a spacer. 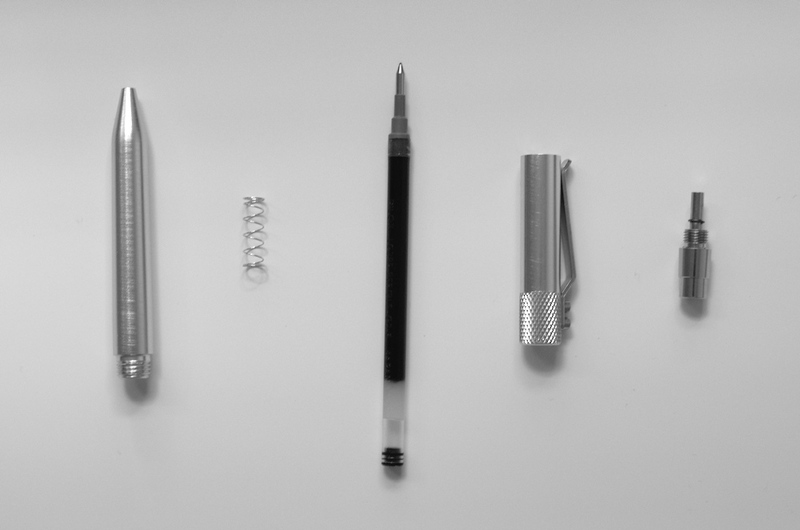 The pen also accepts a Parker ballpoint refill, so that’s what the smaller spring and spacer are for. This pen is really light because of the aluminum. Unfortunately it has a weird weight distribution, and it’s really top-heavy. The barrel is also really thick. The overall shape and size is quite close to a Pilot G-2, except this pen is just a tiny bit thicker. The barrel is smooth and really slippery. It’s hard for me to keep it in my hand. The top and bottom are connected with a screw joint, and both joints are machined from the same aluminum piece the makes up the rest of the part. It’s not very smooth and it sounds like death. Imagine one of those chalkboard squeaks but much worse. I like to take pens apart and put them back together when I’m bored, but it looks like I won’t be doing that with this pen. Maybe I just need to get the threads to wear out a little bit. Overall, it’s a solid pen that accepts a common refill. There’s no doubt that this will last me a long time… but this pen isn’t that good. The weight distribution is really weird, there’s no grip, and it’s difficult to write with. The Retrakt has a knurled metal grip at the clip, but why isn’t that at the other end of the barrel? I’m also not a huge fan of the Pilot G-2 ink, but I do like the G-2 pens overall. The Retrakt Pen is actually worse than a G-2, in my opinion. 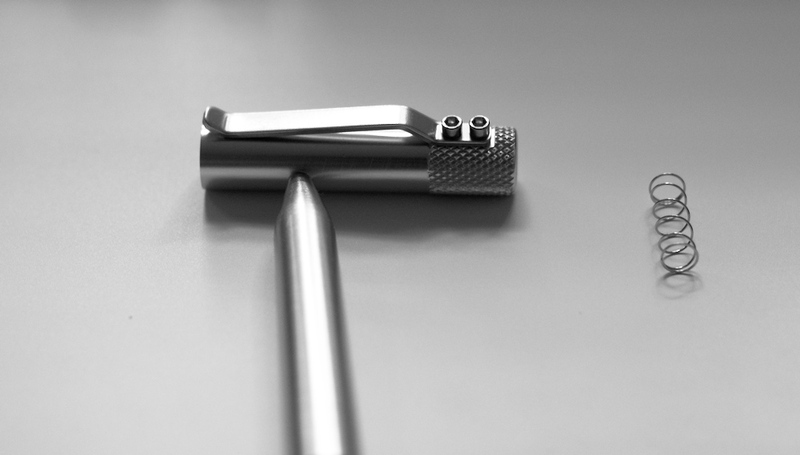 The G-2 has the rubber near the tip that provides excellent grip and balances the weight of the pen.